Cook County Clerk Dorothy Brown announces her endorsement of Amara Enyia for Chicago mayor. 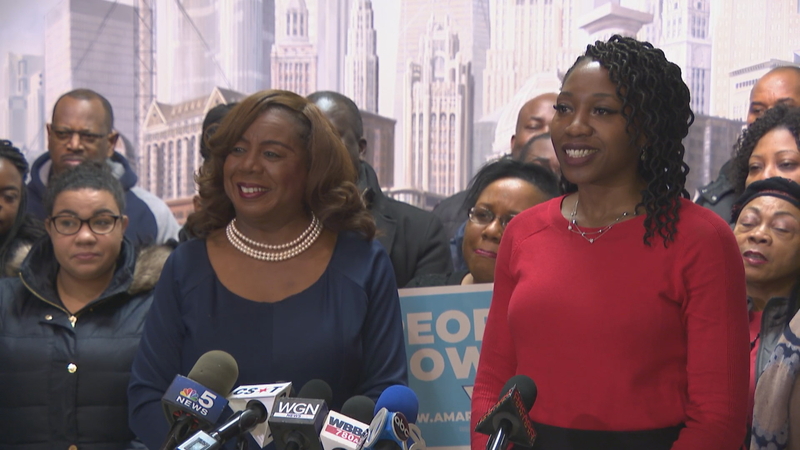 Former mayoral candidate and Cook County Clerk Dorothy Brown announced Thursday that she is endorsing activist, organizer and policy consultant Amara Enyia for mayor. Late last month, Brown was removed from the ballot after Chicago’s Board of Election Commissioners decided she did not submit enough valid signatures to qualify for mayor. There are 14 candidates running for mayor in the Feb. 26 election, including Enyia. Brown said she spoke with several other candidates running for mayor but chose to back Enyia because the two share a vision for the city’s future. While other mayoral candidates have come under fire for connections to Ald. Ed Burke in the wake of his corruption charge, Brown’s time in office has been dogged by a federal investigation that’s led to two charges against employees, accusations of jobs for sale, and orders from a judge to modernize the electronic filing system for Cook County courts.